See scan - perfect condition. 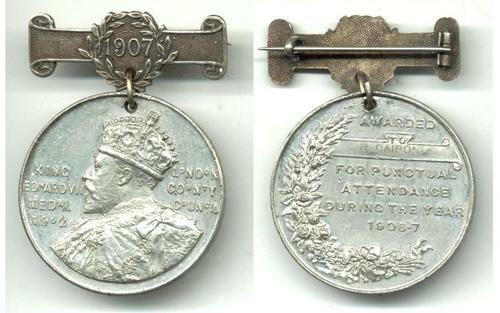 This is a nice Great Britain / United Kingdom medal awarded for Punctual Attendance During the YEar 1906-7 and named to R. CAIRONI. The medal has a silver suspension with year 1907 and obverse has a large bust of King Edward VII with text - KING EDWARD MEDAL 1902 and LONDON COUNTY COUNCIL. Medal has a diameter of 39mm. Nice collector piece and one of the nice Bristish medals. 1906 Romania Royal ROMAN Expo medal RRR BIG !